Like it or not America—and I rather like it—we are going to have a long national argument about the right tax rate for realized capital gains (the increase in the value of your financial assets when you sell them). Candidate Romney is taxed at 15%–not presumably in violation of tax law, but in violation of the Buffett rule (millionaires shouldn’t pay lower rates than the middle class)—because his income is from assets, not earnings, and assets are afforded very favorable treatment in our tax code. 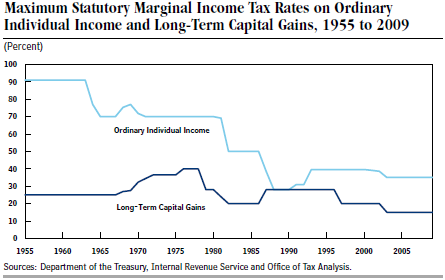 Paul K has nice post up on the history of capital gains tax rates, pushing back on a David Frum argument that there’s an historical precedent for keeping them very low. Allow me to add this figure from an old post of mine, which adds real business investment to the picture. Plotting the top cap gains rate against real business investment doesn’t show much (biz investment is in natural logs to show proportional growth over this long time series). The cap gains rate bounces around based more on politics than policy, while investment pretty much grows with the cycle. Hard to see anything in the picture supporting the view that either the level or changes in cap gains taxes play a determinant role in investment decisions. Remember, the ostensible reason for the favoritism in tax treatment here is to incentivize more investment and faster productivity growth. But that’s not in the data and the reason it’s not in the data is because investors aren’t nearly as elastic to cap gains rates as their lobbyists say they are (more precisely, they’ll carefully time their realizations to maximize their gains around rate changes, but that’s not real economic activity–that’s tax planning). One other point. I took Frum’s point to be not just that cap gains tax rates have been low, but that they’ve been lower than the rates on ordinary income. And here, as this CBO figure shows, he’s right (btw, Frum is always worth reading, IMHO). But again, what’s the evidence for his claim that this differential facilitates better investment outcomes? Show me the research! Eyeballing these two graphs, which is not research (it’s eyeballing), you don’t see accelerated investment when the difference between the two rates was largest. If anything, the one investment boom that’s pretty clear in the top graph—the 1990s—occurred when ordinary and capital income were taxed at very similar rates. What the tax literature does suggest is that the revenue maximizing tax rate for wage income is a lot higher than that for capital income, because investors can time income realizations in ways that wage earners can’t. But all that tells you is that you could set your highest tax rate on earnings at some (politically) implausibly high level, like 80% (check this out) and your cap gains rate somewhere below that. It doesn’t preclude the possibility that they both could profitably—in terms of maximum investment and revenue—be set at the same rate in plausible ranges (say, in the 30-40% range) given the current code. And the problem is not just that the rate on cap gains and dividends is so much lower than the rate on earnings; that problem is much amplified by the carried interest loophole that encourages tapping that difference (this is the one where PE and hedge fund managers–like Gov. Romney used to be–get to apply the cap gains rate to their earnings). Share the post "Capital Gains: Let’s Rumble"
15 comments in reply to "Capital Gains: Let’s Rumble"
This is a classic example of an argument from hypothesis. The hypothesis is stated as it it’s received wisdom, and the argument then proceeds without any evidence ever provided in support of the hypothesis. And, you’re deemed an idiot if you should ever question the hypothesis that has never been tested. But this one’s even worse than that. The hypothesis itself is flawed. Capital gains tax applies only when the gains are realized. Even small businesses with a small number of owners can structure the business as an S corporation so that whatever amount that would show up as a capital gain on the business’ balance sheet can be turned into regular income for the owners via a salary from the corporation. So, the only time a capital gains tax is realized is when the capital assets are sold. And that includes small businesses. If the capital gains rate is less than the tax rate on regular income, then the incentive is for owners to sell the assets of the business when things get rough. If we want the tax incentives to be such that small business owners try to keep the business going through a recession, then the capital gains tax rate should be higher than the regular income tax rate. It seems like we shouldn’t treat all capital gains as equal. Investing in a start-up provides that company the resources it needs to innovate, create new products and services, create jobs, etc. All of which are very valuable to the overall economy and I think those types of investments should not be subject to any capital gains. President Obama also proposed this, or at least something very similar. However, when somebody makes a profit off buying and holding a stock until its value appreciates, how does that benefit the overall economy? Unless it’s an IPO, none of that money goes back to the company to be used to do any of the things mentioned above. I guess you can argue that it creates a market for IPOs or when companies want to sell newly released shares to raise revenue. But we would be a lot better off encouraging investors to put money directly into new ventures. Thoughts? The theory (as I understand it) behind having capital gains rates be lower than earned income is to “incentivize” investment. Why not provide alternative vehicles to encourage investing? Broaden IRAs or other tax-free until withdrawn vehicles, for instance. Or have a two-tiered capital gains rate– zero to fifteen percent for the first $100K or $1M (for small businesses and initial business cost recoup) and then tax at income rates after that. Are there other taxation options that would encourage individual investing while ensuring that people living mostly or entirely off of unearned income would pay rates comparable to the rest of us? And would changing this also close the hedge-fund loophole? The point of lower taxes on capital gains (theoretically) is to create incentives for “investment” in the real economy, thus employing workers and increasing GDP. Unfortunately, studies have shown that more than 95% of all capital gains are from one stockholder buying stock from another, or from sales of real estate, in which absolutely zero dollars are added to GDP and no workers are hired as a result of such investment. In reality, capital gains rates are lower than ordinary income simply because the owners of capital have a whole lot more political influence than the owners of labor. The argument that the guy who whiles away his days at the country club or on his mega-boat shouldn’t pay just half the tax rate of the guy who gets up everyday and goes to work to produce something for the economy are anathema to those who must continuously raise money for re-election. I said this over at Ezra’s blog, but I’ll say it again: if Frum’s piece is an example of a well thought-out, cogent argument for keeping the capital gains tax as low as it is, I’d hate to see a poorly thought-out, incoherent argument. Frum claims that if the capital gains rate were 50%, an investor would be scared off from an investment that would get him a 30% return. But this makes absolutely no sense. Since he would only be taxed on the capital GAINS, that is the 30%, then he would still walk away with a 15% after tax return on his investment. Not too shabby, depending on the timeframe, of course. If Frum wants to argue, as I’ve heard argued before, that long-term capital gains rates should be low because of inflation, or that the value of the underlying asset should be adjusted for inflation and capital gains assessed on the sale price minus the inflation-adjusted purchase value, I’m all ears. But the argument as made is just terrible. It seems to me a pretty easy task to make a graph that replaces the actual tax rate in the first graph with a line showing the regular income to capital gains rate spread (so says a computer illiterate). I may have misunderstood what he was saying, but I thought one of the main themes of Obama’s campaign message in 2008 was to value work income the same as investment income. Romney’s taxes makes a great excuse to bring it up again and maybe do something about it this time. That graph is on the list of things to do. that is actually owed to the federal government – not money that taxpayers have been able to legally avoid paying through creative accounting or the clever use of loopholes. This is a substantial sum. It is approximately 20 times what the federal government spends on Temporary Assistance to Needy Families (TANF) each year, the main welfare program for poor families. It is 55 times what the federal government spends on Head Start and almost 100 times annual foreign aid spending for Sub-Saharan Africa. Alternatively, the taxes that go unpaid each year are 30 percent of what the federal government actually collects in income taxes (personal and corporate). This means that if the federal government could find a way to get tax evaders to pay their bills, then tax rates could be reduced for everyone by 25 percent, and the federal government would have the same amount of money. a good argument for stricter law enforcement to ensure greater tax compliance.However, many of the obvious steps that could increase compliance have been nixed by the nanny state conservatives. For example, it would be a very simple matter to have taxes deducted from interest income on bank accounts or from dividend checks just as taxes are routinely deducted from paychecks. This would ensure that the government had at least a partial payment of the tax owed on this income, and that the IRS had a reliable record of the money that taxpayers received from these sources. If the tax deducted from this income proved to be too much or too little, taxpayers would collect the difference or make up the gap when they filed their annual returns. In fact, in the eighties the Reagan administration actually put in place rules requiring that taxes be deducted from most interest bearing accounts, but more extreme nanny state conservatives in Congress got these rules reversed. more difficult for wealthy people to evade taxes. In the late nineties there was an effort by the wealthy countries to crack down on money laundering, largely as a way to combat crimes such as drug running or illegal gambling. Shortly after President Bush took office, Treasury Secretary John O’Neil indicated that the Bush administration was not interested in this sort of law enforcement.3 In addition to outright evasion, the nanny state conservatives believe that the nanny state should give special treatment to wealthy people for a wide variety of activities. David Cay Johnston documented many practices through which the wealthy can legally avoid paying taxes in his book Perfectly Legal, and there is no reason to go through this list here.4 The wide range of legal methods available for tax avoidance may not have made the income tax an entirely voluntary payment for the wealthy, but, at the least, these tax breaks offer them a substantial discount off the taxes implied by the standard tax rates. Indulgence of tax evasion/avoidance does not extend to everyone. In recent years the IRS has been especially vigilant in policing the returns of people claiming the earned income tax credit (EITC). The EITC is a tax credit for low income wage-earners that dates back to the Nixon administration. It was intended to offset the payroll tax that these workers pay for Social Security and Medicare. The maximum amount that a family could receive from the EITC in 2005 was slightly over $4,000, with most families receiving substantially less. 1. A year is not much of an investment hold. We could provide incentives for longer payback by reducing rates for 3 or 5 year investments. 2. A low cap gains rate doesn’t exactly focus us on productive investments; you gain return just by making it through a year. This means investments which pay back less are favored by the math. A higher cap gains rate means you make investments that pay more. This means you invest in actual things that generate returns instead of things that generate lower returns but have the mathematical advantage of lower taxes if you make it for a year. This graph put me in mind of the “Best of CPBB Graphs: Guideposts on the Road Back to Factville” post. — Graph #1: Income Gains at the Top Dwarf Those of Low- and Middle-Income Households It’s quite a striking comparison to see how radically the top 1% has risen just after 1984, the period when the graphs in this post also show significant change. — Graph #4: Effective Tax Rates on Wealthy Have Fallen Dramatically (1992 – 2007) Again, quite interesting comparisons; the 277% gains appear in the same period that capital gains taxes are severely reduced. — Graph #7: Tax Cuts, Wars Account for Nearly Half of Public Debt by 2019. If the capital gains benefit could be removed from the overall tax cuts category; how much would the ‘tax cuts’ measure shrink? — Graph #12: Real Income for Working-Age Households Reaches Lowest Level Since 1994. 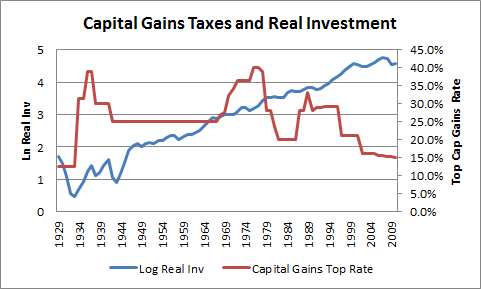 If I compare that graph next to the top one in this post, it appears that real investment rises — yet real income declines — at the very time that cap gains tax rates decline. Again, the divergence between income and tax rates are striking. I recognize that ‘correlation is not causation’, but the top graph in this post eerily mirrors, or reverse-mirrors, of some of the earnings and income patterns in those CBPP graphs. We’ve been going through a fundamental economic shift toward a more networked economy; the economy is no longer very industrially based. Consequently, the dustup about ‘what cap gains rates have been historically’ is a red herring. It’s not a useful parameter. The relevant question seems to be: What tax structures do emerging economic paradigms need? Rumble away, and the sooner the better! The sale of a person’s home falls under the category of capital gains. I know that people aren’t making much on their homes right now, but eventually they will begin to, and to tax the gain at a normal amount seems inappropriate to me. Maybe if the gain was amortized over the same number of years as the person owned their home? I do believe that the Capital Gains tax rate drives the Stock Market. During the current “recovery” the Stock Market has been just about the only robust investment, and I would guess that a favorable tax rate is a factor in that. So, I don’t believe that the Capital Gains tax is entirely bad. I would prefer to clean it up so that the application was limited rather than do away with it entirely. The historical data don’t agree with you regarding cap gains tax rates driving the stock market, or any form of investment. Capital gains need to be taxed at the same rate as any other form of income, your concerns about home sales are valid but easily solved with something similar to the homestead exemption for property taxes. That is no or low cap gains rates on primary residences, normal rates on vacation homes and other real estate investments. If you sell your primary residence and buy another primary residence with equal or greater value, you pay no Cap Gains tax. There is also a one-time exemption from Cap Gains tax if you are over the age of 55. This allows older people to use their home as a retirement account of sorts when they downsize. F.Y.I. – Jared Bernstein gets a shout out. I wrote an article that addresses this issue in 2008. THe article looks into the idea that low taxes are good for growth. I found that tax cuts in interest, divident and capital gains income have the expected *direct* effects. Cutting them produced more of what is taxes. For capital gains, cuts produce greater asset price rises, that is bubbles. However the secondary effects were different. When I looked at trends in nonresidential private investment as a fraction of GDP, I saw that the effects of tax cuts were to reduce investment, which is counter-intuitive. It turns out that the dominant factor affecting this kind of investment was the prevailing interest rate which was high or rising during low tax periods because of large deficits and high levels of financial activity. High levels of financial activity appear to be inflationary by stimulating monetary velocity. Such high levels probably reflect the increasing amounts of investable funds resulting from the grow in size of large fortunes relative to thje economy as a whole. That is rising wealth inequality leads to rising financial acitivity that exerts an inflationary impact, first on assets and then on everything trough wealth effects on demand (e.g. rising home prices allowed additional demand funded by home equity loans). To counter this inflationary impact, policy that reduces growth in wage&salary income and/or employment is necessary. The article has much more on this.